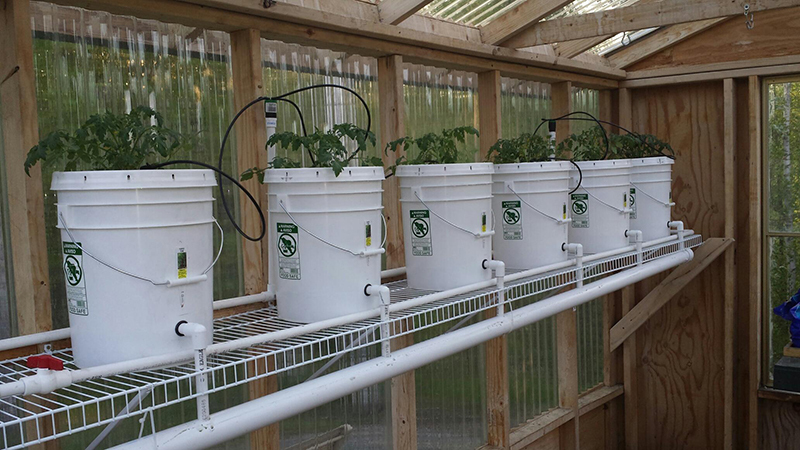 On the right side we will install a hydroponic system similar to one our friends have used in the past with 5 gallon buckets on a wire shelf at chest height for cherry tomatoes, cucumbers, zucchini and squash. This will be the Hub’s first project of the season since I want to get things growing as early as possible due to our very short season. Two photos courtesy of Anne-Tiques. Hopefully, we have results as good as theirs! Below the hydroponic system will be 4 tubs where I plan to have garlic, dill, onions and carrots. Each of these tubs will be on a plant caddy so it can be wheeled out for tending when needed. There will also be 4 tubs on caddies on the opposite wall. I will have two varieties of peppers – one on either end and the two tubs in the center will contain green beans and peas. I plan to use the two bed frames from the wheel bed last season to act as trellises for the beans and peas. I’ll also hang large PVC pipe with holes cut out for planting strawberries in either corner on this side. The gutters that held the strawberries on the fence last year will be attached to the side of the greenhouse for lettuce, spinach and chard or kale. Another wire shelf will be installed under the window on the back wall to serve as a potting station. The large metal trash can will hold my potting soil and will sit underneath the wire shelf so it can catch dirt as it falls through. It will also be on a plant dolly so it can also be moved easily when needed. My pruning tools will be kept in a container of fine sand on this shelf as well to help keep them clean and sharp, as well as easily accessible. I’d like to try a potato tower or crate planter on the back corner of the green house past the gutters. It’s an out of the way spot, but I can water it from inside the yard and the dogs should keep any inquisitive moose away since it’s between the fence and the green house. The set-ups I’ve seen on Pinterest look fairly easy to set-up and maintain so I’m game to have ingredients for stews come fall! I may add some flowers beds around the side and back of the greenhouse, but we’ll see how far I get with our edible crop this season. I’m thinking either dahlias or peonies since both are great for bouquets and could be cut easily while I’m already out harvesting food items in the greenhouse. Plus, being perennials, they would come back year after year. Luckily the faux rock we got for the septic pipes inside the fence, worked perfectly out here to cover the leach field vent pipe so it’s not an eyesore next to my pretty green house! And of course there will be plenty of pretty flower pots and garden décor out front of the greenhouse. If you looked closely at the pictures from my last post you might have noticed two wooden chairs off to the side of the building site. I have grand plans to make one into a planter using chicken wire to build a basket where the seat used to be and the other will be a stand for containers of flowers. Of course moving all of our edible crops to the greenhouse leaves the Garden Box in the back yard available for other things. I’m thinking it might become my cutting garden for bouquets. It would be something pretty to look at out the family room window and would be convenient to use, but I’ll have to plan out which flowers are in each tub since the middle window opens out and we use it quite often during the nice summer weather. 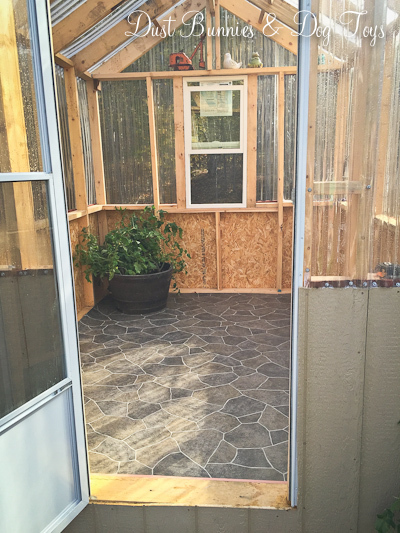 Our herbs will soon have an spot inside the house where they can grow year-round for continued use, so I don’t need a spot for them in the greenhouse. I’ll share that project once it’s installed and finished. I plan to have parsley, oregano and basil. I may do a few varieties of basil if I can find them available locally. We’ve already got mint and chives out in the rain garden so that should give us a good variety to work with and we’ll have room to add other items as we learn what does well and will be used the most. It’s an ambitious plan but I want to give it a good shot with our first season. If you have suggestions on other crops we should consider or tips for any of the ones I mentioned I’d love to hear them. I also want to hear thoughts on if it’s worth the effort to paint both the interior and exterior of the greenhouse white. 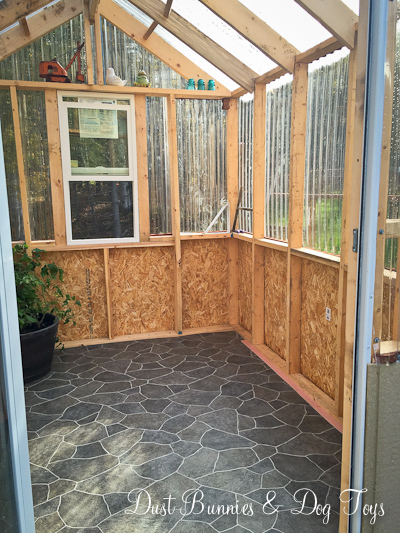 I think it would give it a nice clean farmhouse look, but I’m not sure improves functionality or practicality, so I may hold off and do that at the end of the season when we close up the greenhouse rather than before when I need to focus on getting things started. Tell me what you think with the poll below. I look forward to hearing your suggestions and sharing the progress when spring arrives! Just as I was about to start a photography session the other day I spotted these pretty little flowers next to a building and immediately the gardening bug took hold. 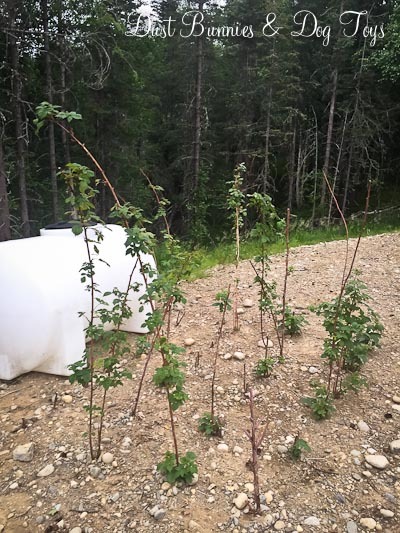 I’ve been day dreaming about what I’ll do in the yard this season for weeks as the temps have started to warm early for Alaska standards, but now that I’ve seen sprouts in person I’m narrowing down the plan so I’m ready to get going May 1 as soon as No Spend April is over. While that might seem a long time to wait in most parts of the country, it’s pretty typical for our zone and the local nurseries won’t have many items available until around that time anyway. I spent a chunk of the weekend cleaning out the remnants of last year’s annuals from the pots around the yard and spreading marigold seeds from the deadheads I’d pinched and dropped at the roots all last season. Since the deadheads had enough seeds to cover all of the whiskey barrel planters, I’m hopeful they will produce at least enough to fill those so I can spend a few more dollars on other items when I do head to the nursery. 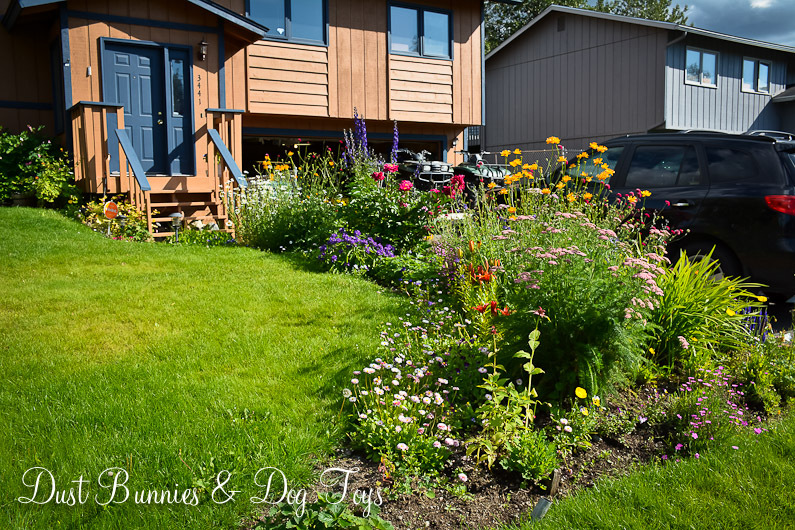 First up on the plan is the garden box we installed just off the deck last season. I’m planning on having lettuce, cherry tomatoes, peppers and onions (which I’ve got in water growing roots after one sprouted in the pantry!) in this space. 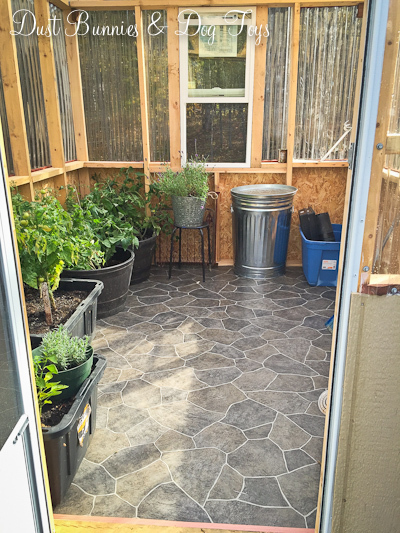 I may put the tomatoes in a separate container – like a cool old wash tub or burlap covered bucket – on the far side of the box so they don’t block the view of the yard from inside but we’ll see how it works out once I have everything ready to be planted. The box itself will need a little tune up after the beating it took all winter. When we placed it here I thought the water coming off the roof would be helpful, but too much of it created serious problems including flooding in the box bins which then turned to blocks of ice with winter’s early arrival last year. Although we didn’t get a lot of snow last season, what we did get came off the roof in batches and formed a small mountain range of snow across the top of the tubs which added to the weight of frozen water inside. To solve those issues this year we’ll be installing a gutter across the back of the house which will empty into the rain barrels relocated from the front flower beds at either end. That will make it easier to water the gifted garden on one side and should provide a constant water supply for the chickens during the summer on the other! The big metal wheel the hubs brought home for me is still against the fence in the low spot across from the corner of the deck where I put it at the beginning of last season. I’ve decided to add a small retaining wall in a semi-circle around it and plant cucumbers there so I can train them to use the wheel as a trellis. Of course I’ll have strawberries again this year, but I’m going to try the hanging gutter system I’ve seen all over Pinterest. 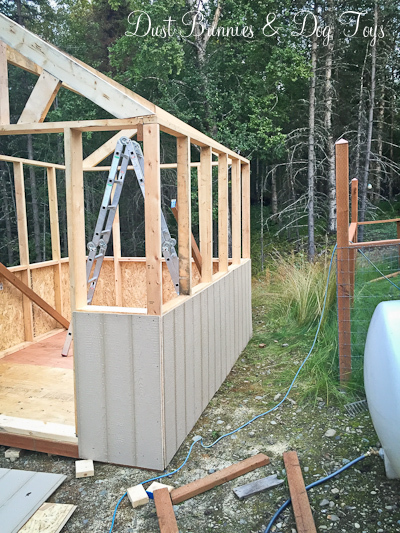 There is a good spot between the fence posts behind the shed, where I think the moose wouldn’t be able to reach them easily and if they did the dogs would soon chase them off. I signed up for a “Do It Herself” (DIH) workshop at Home Depot later this month where I’ll make the gutter planters with the assistance of an instructor, so that should be ready in advance of my nursery shopping trip. I may also do potatoes in a pallet planter below them, if I have enough budget left. The herbs will go in a bucket tower like I’ve done for strawberries in the past. I’ll put that right next to the Big Green Egg table so the hubs can snip things he wants to use while cooking quickly and easily. I plan to have oregano, basil, parsley, cilantro, garlic and possibly dill depending on space and budget. One of the bushes I planted on the side of the deck *mysteriously* came unrooted back in the fall, which I’m sure the dogs had a paw in. Ultimately that works out because the rain barrel will need to sit right on the corner of the house and would have crowded the bush anyway. The remaining bush took the brunt of the snow shoveled off the deck during the winter so I’m not sure how well it will bounce back, but I’m hopeful it will at least add some greenery if not bloom. 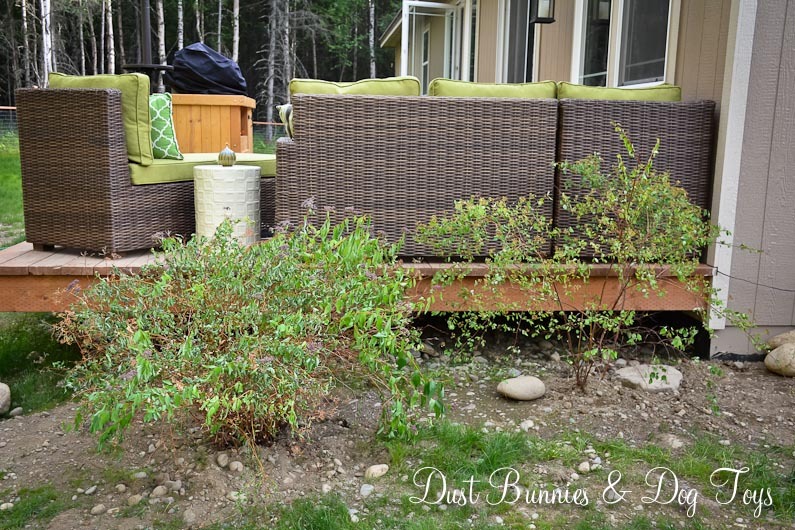 I have two more spirea bushes I picked up at the end of the season and never planted that have been sheltered next to the house, so I’ll plant those along the deck as well if they show signs of growth. I also have a large purple ceramic pot that will become a recycling fountain and will find a spot in this bed. I originally planned to have it out front but we don’t spend as much time on the front porch as we do on the deck so I think it will be enjoyed more here, plus it will help fill in some space since this is a large area to cover. 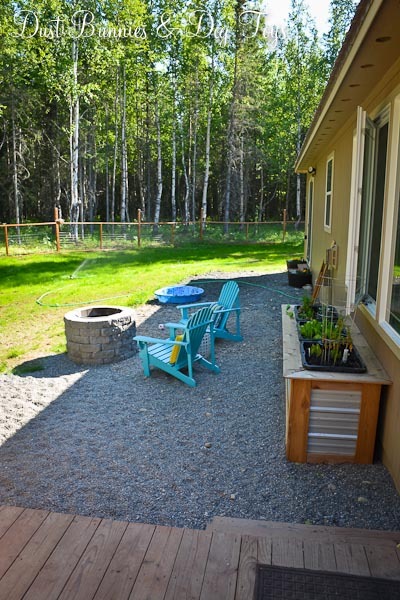 The pretty blue planter that was on the deck last year will also move down into the bed around the deck, to create a bit of height and plant variety with an annual or two. I’ll be moving things around in the flower beds a bit too. 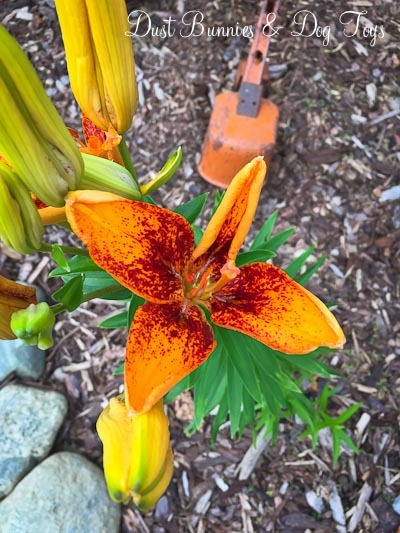 The lilies out front will be moved to the gifted garden to fill in some holes there and make room for several new plants including salvia, lavender, delphiniums and daisies to fill in around the iris and hostas that are already in the front beds. My plan is to fill the entire space with perennials that come back each year bigger and bigger so it creates something like my co-worker’s bed which provided the beginnings of my gifted garden. Although I planted the freebie lilacs in the rain garden when we first set it up, I knew they would eventually be moved elsewhere. That was just a convenient spot for me because I could tend and water them as part of the rain garden. They struggled a bit last year, and rather than wait for them to develop and shock them again with a move I’m going to go ahead and relocate them now. I figure if they don’t survive this move it’s not a huge loss since they were freebies anyway and haven’t shown much in potential yet. 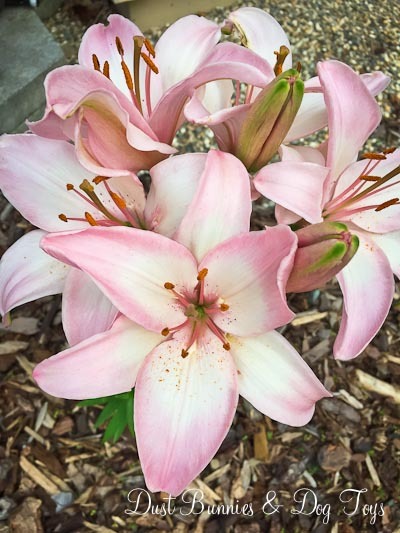 They will be moved to the hillside next to the garden where hopefully they will take root and establish themselves with plenty of room to grow and spread. Their departure will make room for a third clematis along the tire wall in the rain garden. That will put it in the center of the curve along the back portion, so when it grows in it should help fill the space between the two existing clematis on either end of the tire wall. Finally, the hubs plans to install a gutter on the side of the shed which will feed the freebie water tank we picked up last year. That will be the water supply for the raspberry patch near the shed and the rain garden if needed. Apparently no spending equals lots of planning! 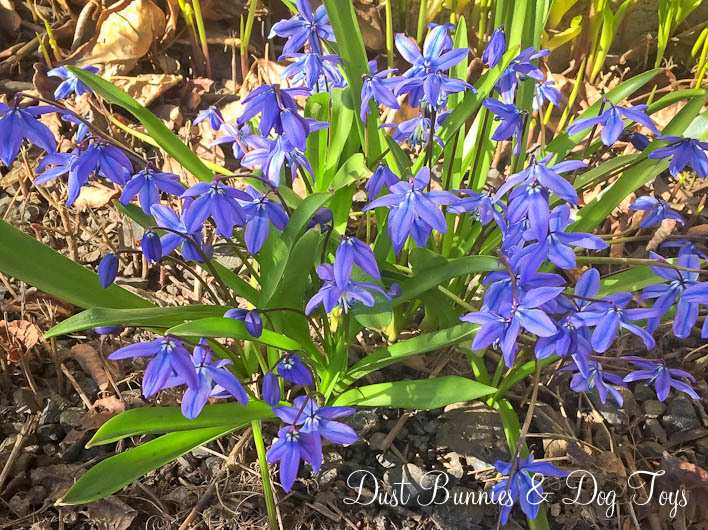 It seems pretty intense when it’s all written out, but I think I’ve got my list ready so I’ll have a plan when I go plant shopping which should keep the budget in check and fill the yard with plenty of pretty!